Local Organization Seeks Help in Supporting Homeless Women -- Will You Help? 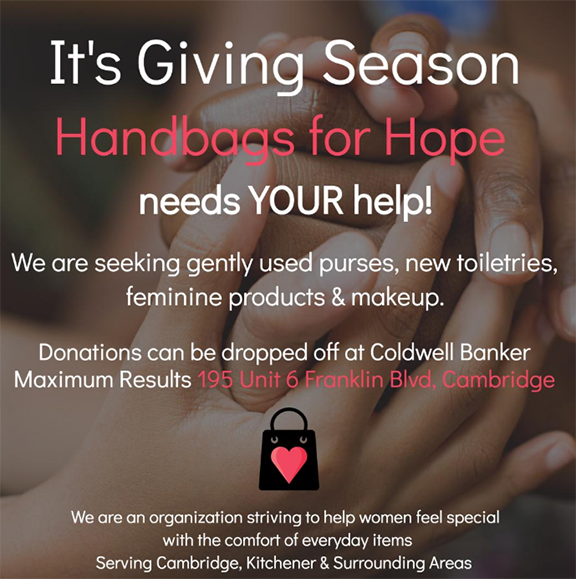 Cambridge, ON – Local organization Handbags for Hope is looking for support in their third annual drop off to local women’s shelters across the region. 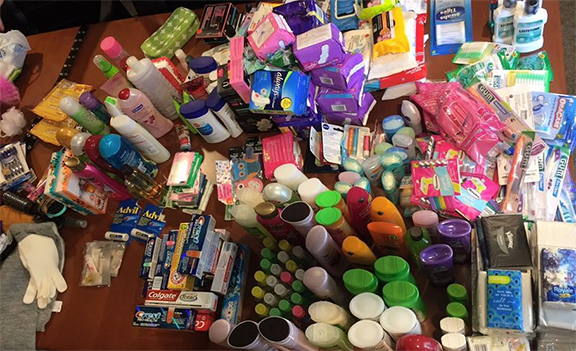 Support includes donations of gently used purses, new toiletries, feminine products & makeup. Inspired by a charity in Australia Share the Dignity, Karen Monteiro from Mortgage Alliance Maximum Results created Handbags for Hope. Handbags for Hope is an organization striving to help women feel special with the comfort of everyday items. Last season, Handbags for Hope collected and filled 60 purses and donated them to the Cambridge Bridges in Galt and the Argus Residence. With donated items, Handbags for Hope fills gently used purses and handbags with products that are useful for women. This can include but is not limited to: soap, body lotion, toothbrushes & toothpaste, shampoo & conditioner, deodorant, feminine hygiene products including tampons and pads, tissues, hairbrushes, hair elastics, lip chap, perfumes, manicure sets, and makeup products. Purses will then be dropped off at local shelters across the region to support women in need. Donations can be dropped off at Mortgage Alliance Maximum Results 195 Unit 6 Franklin Blvd, Cambridge, ONTARIO OR if you can't get it to us, we can arrange to have it picked up until December 20th, 2018. Editor's Note: If you're travelling and staying in hotels, think about bringing the toiletries (which come with your room everyday anyway), home with you for less fortunate women in your community. So many of us are fortunate to have OPTIONS and EXTRAS ...Will you share with these local women?